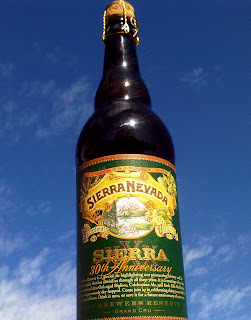 Sierra Nevada has released the final beer celebrating their 30th anniversary. The series began with Fritz and Ken's Ale, an Imperial Stout. Then came Charlie, Fred, and Ken's Bock. The third installment was Jack and Ken's Ale, which is a Barleywine. In the finale of the anniversary series, we finally get a beer without Ken's name in it: Our Brewers Reserve Grand Cru. The Grand Cru is a unique 78% blend of Sierra's Pale and Celebration ales, and 22% Oak-Aged Bigfoot Barleywine. See? Blending your beers is cool! They may not be blending their beer with Miller High Life, and I don't use the percentage ratio when I blend, but who knows? Sierra and Miller could be in talks for a 31st Anniversary collaboration. $9.99 gets you the 25 oz bottle with the fancy cork and the 9.2% blend inside.